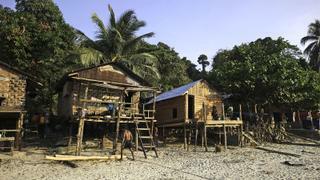 A Moken Village on one of Mergui’s 800 islands, of which 200 or so are inhabited. Picture courtesy of Shutterstock.com / njmucc. Boats in the Mergui islands Picture courtesy of Shutterstock.com / SolarZebra. Houses in a Moken Village. Picture courtesy of Shutterstock.com / Steph Andaman. 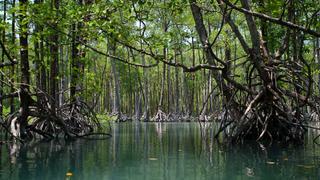 Massive mangrove trees make up extensive forests in the Mergui Archipelago in Myanmar. Picture courtesy of Shutterstock.com / Ethan Daniels. 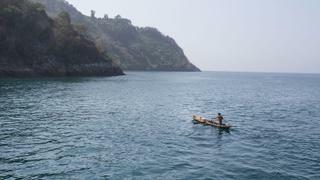 A Moken man rowing a fishing canoe on Andaman Sea. Picture courtesy of Shutterstock.com / Azuresong84. Sophy Roberts travels to Myanmar’s Mergui Archipelago, where she meets members of the indigenous Moken tribe and enjoys a landscape so remote, it feels like her group is the first to make landfall. One of the most curious episodes of the five days we spend cruising the deeply curious Mergui Archipelago, down Myanmar's southern coast, on board 17.6 metre charter yacht Colona II is the sight of three plastic planes. All of them are broken toys. All three, however, seem to have been invested with some kind of quasi-religious significance: they hang above makeshift shrines in the villages we visit. Only later do I learn that to the indigenous tribe who live here – the Moken, or sea gypsies – the plane is a “bird goddess”. At one time, jets terrified them in their strangeness, hence the machine’s elevation to supernatural status. It is therefore hard to imagine how disruptive to the Moken world order the sight of a superyacht must now appear. A yacht charter in Mergui is the new Holy Grail in adventure cruising, concealing within its green and aquatic folds this intriguing – and fast-diminishing – hunter-gatherer tribe. During the military junta’s 50-year period of absolute power in Myanmar, Mergui was among the more contentious swathes of a deeply contentious country. The archipelago was defined as a “remote region”; to visit required complicated permissions, with a large number of its 800 or so islands completely off-limits. It was also during this period that the Moken – also known by the more romantic as the 'vagabonds de la mer' – were “encouraged” by the Burmese government to give up their nomadic life on the water and move to new settlements alongside colonisers migrating from the mainland. But since the dubious general election in 2010 and the lifting of the tourism boycott, the red tape is loosening. Yacht charter outfits such as New York-based Remote Lands are promoting Mergui as the “new Andamans”, open to visitors from October to April after the monsoon has passed through. The Maldives may have comparable bone-white sand but Mergui is more dramatic, with rocks tumbling onto beaches; the rocks, in turn, tumble out of impenetrable green forests. The water looks jade from the shadows cast by the close-growing mahogany, teak and strangler fig, which are knotted together with thick vines. There are mangroves and black lagoons. There are horizons of a ludicrous turquoise. There are also less-than-perfect vistas hidden beneath the surface of the water. Mergui’s coral reefs show evidence of having been bombed out by dynamite. Small fish, and a few soft corals are returning, but the kaleidoscope one might expect of such a place is absent. The shark population has gone, hunted out for fins. Stories of large shoals have been replaced by an image our skipper describes: 20 or so fins pinned to a line on an island, where they were left to dry. That was a decade ago. But then this is hardly surprising when, for 50 years in Mergui, no outsiders were looking at what was happening in this part of the world. This includes the erosion of the culture of the indigenous population: a 1911 British colonial government census put Moken numbers at 5,000; a 2005 Burmese census cited 2,000. On this superyacht charter we visit the Moken in their stilted villages and see for ourselves how difficult it is for these so-called sea gypsies to adapt to a life on land. They want to trade the photographs we take of them for whisky and rice. “I think in 20 years the moken living on the sea will be gone,” says my guide. Lacking the commercial nous of the mainlanders, the Moken are, in effect, an underclass. They seem lost between two worlds. They used to trade sea pearls with Malays and Chinese; since 2000, this has been illegal. They used to make their “mother boats” from single trunks; now they can’t because logging is banned. The extended family once travelled in a dozen or so dug-out canoes, pulled by the mother boat. For centuries, these people lived on the water like this, for up to eight months a year. Only during the worst of the monsoon, when the swells were too large, would they camp out on the foreshores of islands, living off molluscs, oysters, fruit and yam. The Moken were elusive. Early travellers described them as like ghosts; they always seemed to see you on the horizon before you saw them. Our encounters with them also prove the most compelling part of the luxury yacht charter, which we mix up with snorkelling and beach picnics, buying lobsters from locals and trading for fish from long-tail boats. We moor off islands where we could swim naked for days and no one would find us. We kayak through mangroves, looking for the bird life that we can hear before we see. We snorkel for hours, harvesting the seabed for exquisite shells. We make sand angels on curvatures of beach that are so perfectly sculpted, we wonder if we are the first people to make landfall. We find a Moken woman on a beach boiling up oysters in a small tin pot. We spend our days anchored off shoreline settlements, looking for more of her people. A group of men paddle towards us; in other canoes are children. As the Moken come close, the young ones leap into the water. They swim with the confidence of fish. I watch the way they let themselves be carried by the current as far as it needs to take them, then when the pull has softened and they can feel a change in its direction, they swim back towards our boat. When I get into the sea with them, one of the boys kicks to seven or eight metres below, beyond my clear vision. I think of the meaning of maw khen, which translates as “drowned people”. I wonder at their ingenuity, of the stories of their people free-diving to 20 metres or more. To see them like this, pulling up sea urchins from the ocean floor, is to my mind a privilege beyond the jet skis that zip around the superyachts appearing in this wildly beautiful archipelago. The fragility of this disappearing culture requires not just deep pockets to access, but an open mind to understand the issues at play. 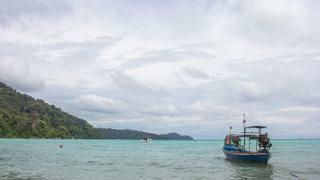 Mergui may be the new Andamans. What it is not, however, is just another one-dimensional paradise. 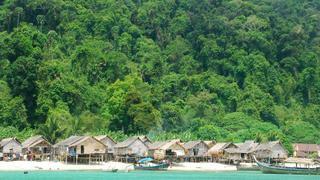 Sophy Roberts travelled to Mergui with the support of Remote Lands. The company organises flights from Yangon to the Mergui access port of Kawthaung (about 90 minutes), as well as permits and English-speaking guides.